1/4 cup Peanuts (30 g), finely ground in a food processor or with a Mortar and pestle. Cut the meat into bite sized squares and place in a freezer bag, along with half of both the ginger and garlic, 3 tablespoons of the ketjap manis, the juice of one lime, 1 Tbsp Sambal and 1 tablespoon of oil. Knot the bag, massage the marinade into the meat, and leave to marinade in the fridge overnight or for a least 4 hours. Fry the onion in the remaining tablespoon of oil in a saucepan. Once the onion has caramelized, add the rest of the ginger and garlic, the peanut butter and the ground peanuts. Add the rest of the ketjap manis, the coconut milk, the lemongrass and the lime zest, and bring to a simmer for 10 minutes. Now add the sambal and taste for seasoning. If the sauce has thickened too much at this point, add some warm water. Fish out the lemongrass and give it a quick whisk before serving. Thread the meat onto the satay sticks. It is now ready to barbeque or grill. If you don’t have access to a barbeque, heat a griddle pan and grill the meat for about 8 minutes, turning regularly. 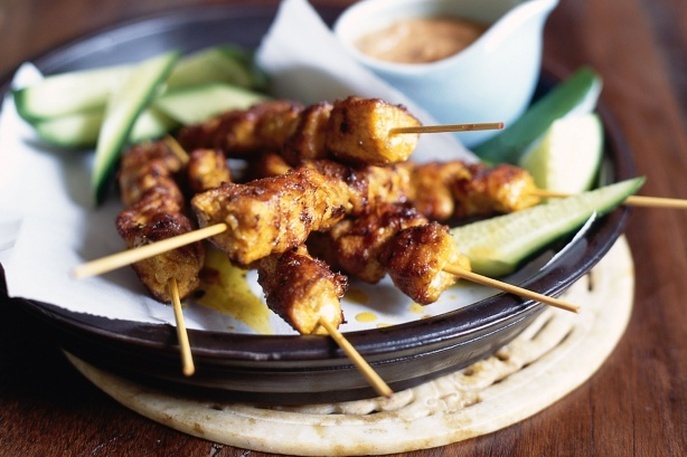 Top the meat skewers with the satay sauce and serve with fluffy white rice, or french fries, a cucumber salad and some crunchy prawn crackers.